Prince William and Kate Middleton have announced the nursery school Prince George is to attend alongside the release of a new picture of their family. Prince George, 2, will go to the Westacre Montessori School Nursery in Norfolk from January. 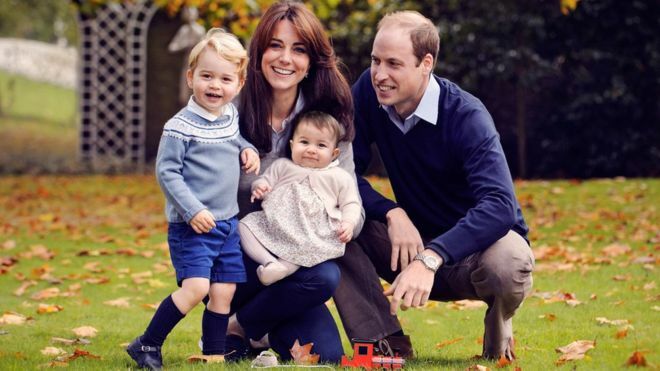 The nursery is close to Prince William and Kate Middleton’s home, Anmer Hall. The nursery said Prince George would “get the same special experience as all of our children”. The new picture shows the duke and duchess with their children Prince George and Princess Charlotte in the garden at Kensington Palace. It was taken in late October by photographer Chris Jelf. Kensington Palace said that the royal couple were “very much looking forward to their first Christmas as a family of four” and “hugely appreciative of all the warm messages they have received about their family this year”. The early learning at the Westacre Montessori School was rated good by Ofsted after an inspection in June 2015. It costs £5.50 an hour or £33 a day to attend the nursery. The school follows the principles of an Italian doctor called Maria Montessori who developed a new approach to teaching in the early 20th Century, in which children take responsibility for their own learning. Prince William was the first senior royal to go to nursery and not start his education in a palace.